Beginning With H.. I.. J.. 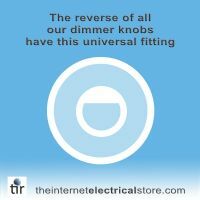 Yes, all standard dimmer switches are supplied with fixing screws & instructions on how to wire the switch. Each switch varies in the wattage it can run. This can be worked out by a simple mathematical calculation of the following... Maximum wattage of the dimmer switch divided by the wattage of the dimmable bulb you wish to run. For example, a one gang 250 watt dimmer switch can run a maximum of 5 x 50 watt dimmable bulbs. Please Note: It is not wise to use the switch to its' maximum load. Can you buy replacement knobs for the switches? Over time things become worn naturally and if necessary replacement knobs can be purchased for the switches. However, please note replacement modules are not available. How deep must the back-box be in order to accommodate the dimmer switch? The depth of the switches vary. Some may require a deeper recess in the wall. All switches will fit comfortably in a 25mm back-box, however the bigger the air space around the module, the better the air flow will be around the module to promote cooling. There are a number of beautiful finishes to suit your taste and the style of your room. These include Matt Chrome, Satin Chrome, Mirror Chrome, Iridium Black, Jet Black, Premium White, Standard White, White Chocolate, Victorian Brass, Antique Brass, Pewter, Brushed Brass, Wooden, Graphite & Mocha. Other finishes are available, for example Granite. Please enquire at sales@theinternetelectricalstore.com or call 0800 043 5532 for other finishes not listed. What styles are available for Standard Dimmer Switches? What is the difference between Rotary & Push On/Push Off dimmer switches? Rotary dimmer switches must be turned to switch the light on/off, whereas Push On/Push Off dimmer switches turn the light on at the setting previously chosen. What is the difference between V-Pro, V-Plus & Standard Dimmer Switches? V-Pro are specifically for LED's, V-Plus are Trailing Edge dimmer switches and Standard Dimmer Switches are used for CFL & Halogen bulbs. What is the difference between a 20 watt and a 40 watt minimum load? Low Load dimmers are specifically for LED's, the dimmer range is here, a standard dimmer such as Hi3, has a minimum load of 40 watts, so make sure you have atleast that load (ie 2 x 20 watt bulbs or a 40 watt halogen), if 20 watts such as a JSP401.